The lobby ceiling of a five-star hotel at Jalan Stesen Sentral here collapsed this morning, injuring one Bangladeshi worker. In the 3.30am incident, the worker was carrying out repair works involving electrical wiring above the ceiling when it collapsed under his weight. A Kuala Lumpur Fire and Rescue Department spokesman said the man fell from a height of 12 metres and suffered injuries to his head. The spokesman said the collapse did not compromise the building’s structural integrity. “We received a call at 3.40am on the incident and a team of firemen from the Pantai, Hang Tuah and Seputeh fire stations were deployed to the scene. 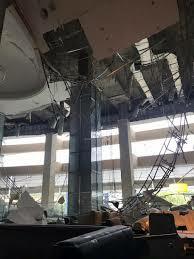 “The firemen discovered that the collapse had occurred at the guest waiting area of the lobby and that the incident was related to repair works being carried out,” he told the NSTP when contacted today. The worker, he said, was sent to the Universiti Malaya Medical Centre (PPUM) for treatment. He added that the fire and rescue team subsequently conducted a check of the hotel together with the management and confirmed that there were no other casualties.